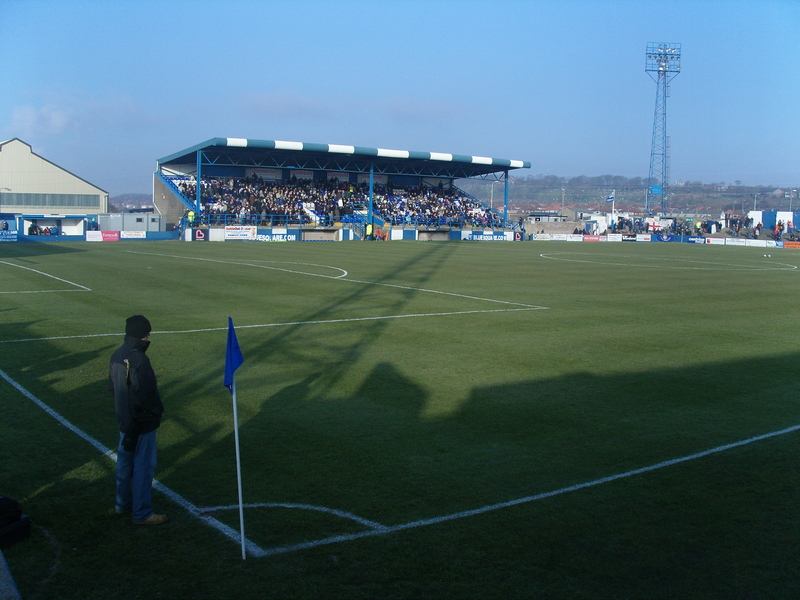 Ground Name: Holker Street Capacity: 4,256 (Seats 1,000) Address: Wilkie Road, Barrow-in-Furness, Cumbria, LA14 5UW Main Telephone No: 01229 823061 Fax No: 01229 823061 Team Nickname: Bluebirds Year Ground Opened: 1921 Home Kit Colours: Blue & White Official Web Sites: www.barrowafc.com About Holker Street Holker Street, whilst being home to the club since 1909 has also played host to Speedway and Rugby League. The ground has remained unchanged since the redevelopment of the main stand in the mid 1990s. Described as having “a traditional, old fashioned feel”, the ground has three sides of terracing and one all-seater Main Stand, the latter with a capacity of around 1,000. The Main Stand, backing onto Ray Wilkie Road is raised above the central portion of the pitch, with flat standing on either side. The Popular Side now has the only covered terracing, opposite the Main Stand. The Holker Street end is the traditional base of the home support, though it is now uncovered and thus open to the weather which comes in off Walney Channel; this end is now sometimes given to away fans. 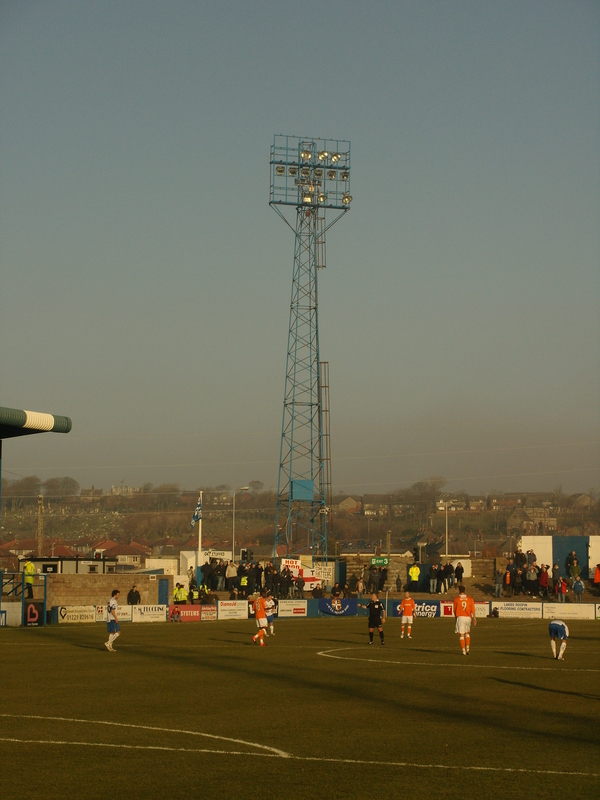 Otherwise, away fans are usually accommodated at the steelworks end, which has the smallest and least used terracing. The only seating in this area is a small wooden bench. This end is dominated by the CrossBar which houses the club’s offices. Holker Street’s facilities are rather spartan, and the ground would probably not be suitable for Football League Two, the level above which Barrow AFC currently play. Stadium share proposals with Barrow Raiders rugby league club are often mooted. The most recent plan was for the two clubs to share a stadium in Barrow’s redeveloped dockland, though no significant plans have ever been made and the Barrow AFC board currently appears to favour further improvement and development of Holker Street. How to find Holker Street By road: M6 Junction to junction 36, then onto A590 signposted Barrow. Follow A590 all the way to the outskirts of Barrow, entering via industrial route towards the Town Centre. Passing the fire station on the right, take the next left into Wilkie Road. The ground is on the right hand side. Post code for Sat-Nav is LA14 5UW. The nearest Station is Barrow-in-Furness. On leaving the station, exit onto Holker Street. Turn right and ground is approximately ½ mile on the left. How to get a ticket for Holker Street Despite the club’s desire to double attendances to over 2,000, there are still plenty of tickets available on a matchday. Tickets can be bought in advance from the club in person or by phone – 01229 823061. Ticket prices for this season are Terracing £13 (concessions £10 – £3), Stand £14 (concessions £11 – £3). About our last visit versus Luton Town – February 2010 One of the classic adverts of the 1980’s was surely the Monster Muncher who was not satisfied by the Taj Mahal, The Leaning Tower of Pisa and The Empire State Building before he came across a packet of Chewits. As the credits rolled, the ad stated that “Chewits were chewier that Barrow-in-Furness bus depot”. (for a view of the ad click here). The Ad put Barrow on the map, just like Lorraine Chase did for Luton Airport, or Ian Rush did for Accrington Stanley. Ironically enough Barrow doesn’t have a Bus Depot…but it does have a football team, which can claim to be one of the most northerly in English football. Barrow AFC have made a nice little home for themselves in the Blue Square Premier. They have actually quite a heritage in the Football League, gracing the old Third Division North in 1921 and then continuing in the leagues for a further fifty one years. In 1970 the club finished in 8th place in the third tier of English football, but the two following seasons saw the club slip down the leagues until they finished in last place in May 1972. This was the time of the Football League closed shop so there wasn’t any automatic promotion or relegation to the non-leagues. 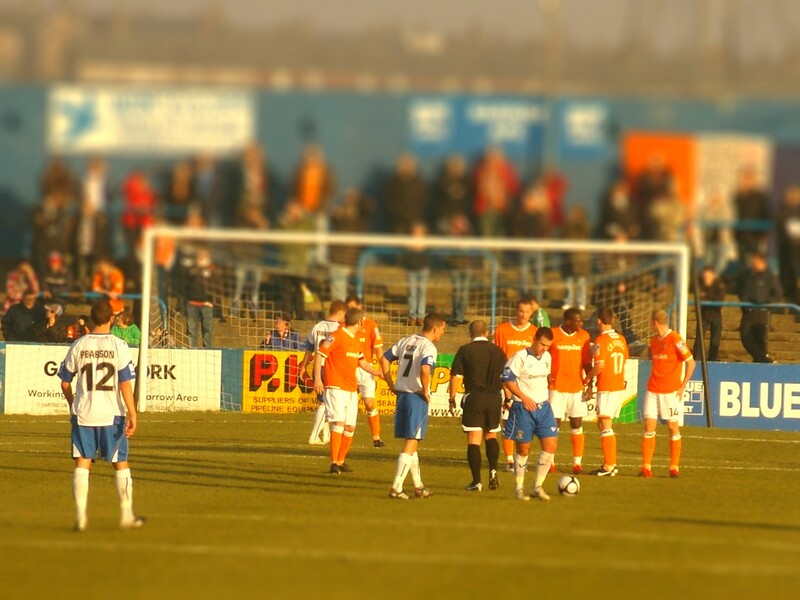 Barrow applied for re-election, and were pitted against Hereford United from the Southern League. Perhaps a few clubs were fed up with the long trawl up to Cumbria and that may be the reason why after a second ballot, Hereford were elected into the league at Barrow’s expense. The club continued to play at the highest levels of the non-league game, and were one of the founder members of the Alliance Conference in 1979. In 1990 they went to Wembley for the first time, winning the FA Trophy against Leek Town. After a brief spell in the Unibond League, the club returned to the Blue Square Premier in 2008. Last season they made waves in the FA Cup, beating Brentford at home in front of the TV cameras and then narrowly losing to Middlesborough at The Riverside where their 7,000 travelling fans almost doubled the fickle Boro fans. This season it has been more of the same really. At the end of January the club were in the lower reaches of the Conference, but with games in hand on all those around them. Another run to the FA Cup third round saw them again travel to the North East, this time at the Stadium of Light where Sunderland beat them 3-0. The club have a large catchment area with only really Carlisle United and Workington (another old league club now in Blue Square North) to compete with. The club’s average attendance of 1,290 was slightly above average in the league, but they had started a campaign to raise this to 2,010 for the final ten games of the season…And first up was Luton Town, a club who would certainly bring a few hundred fans. So why, you may ask was the TBIR extended team out for this game in Cumbria? Well, at the start of this season I vowed to CMF that I would do “all Blue Square Premier and South clubs this season”. The only one I didn’t get to last year was in fact Barrow in the top league. This season they have been joined by Hayes & Yeading (less than 20 miles from TBIR Towers and Gateshead) so it was always one I wanted to visit. Of course, Football Jo has a few “links” with Luton Town (see Taking The Mike), so we planned to use that as an excuse for a visit “up north”. Not fancying doing this one in a day (only a 645 mile round trip), I came up with the cunning idea of selling it as a “family” weekend away, and booked Centerparcs some 70 miles away in Whinfell. This would mean taking the girls out of school for a day (so teachers close your eyes now) but I figured that the school will close for the elections in May as its a Polling Day and so they would owe us a day. Now Luton Town. Hmmm. I was quite outspoken back in October about Mick Harford’s removal (see here), based on the club’s position and the high expectations set by fans and the owners alike. so when he left the team sat in 6th place, a point outside the play off zone. Coming into this game the club were in 7th place, a point outside the play off zone. New boss Richard Money had delivered some improvements, but I think the club, and the fans under estimated how difficult this league would be. Oxford appeared to be running away with it initially, but Stevenage had now almost matched them result for result, and York with one man goal machine Richard Brodie had opened up a big gap in the top three so in order to stay within touching distance of the Playoffs they would need a result “up north”. Saturday morning dawned with beautiful sunshine. Bloody freezing, but a crisp sunny winter’s day. After a game of Adventure Golf (what happened to the words “Crazy Golf”? I assume they felt that it discriminated against those with mental problems. There is no adventure in slotting a ball between the legs of a concrete Roman soldier anyway) where Littlest Fuller had a huge tantrum, resulting in a slamming-down-of-her-golf-club sort of action after she took 3 shots at the third hole we headed off towards Barrow-in-Furness. Now we had the “fast” route (69 miles and around 70 minutes down the M6) or the “scenic” route (65 miles or 125 minutes). On the advice of Stuey Nichols, one of Barrow’s top chaps, we plumpted for the latter, not having been in this area of the world before. So after a brief stop at the most scenic ground in England, Penrith FC’s new Frenchfields stadium (what other grounds can claim to be bordered by a stream, a 11th century castle, hills full of sheep and snow capped hills) we headed west past mountain, fell,glen, lake and all. After two hours of driving up hill, down dale and along the lakes of Thirlmere, Gramere, Coniston and Windermere, we decamped next to Barrow AFC’s Holker Street ground and not a moment too soon. The countryside is beautiful up here but after avoiding walkers, sheep and dry stone walls for the hundreth time you get a bit bored and long for some litter, grafetti and traffic lights, so the run down council estates was a welcome site as we entered Barrow. 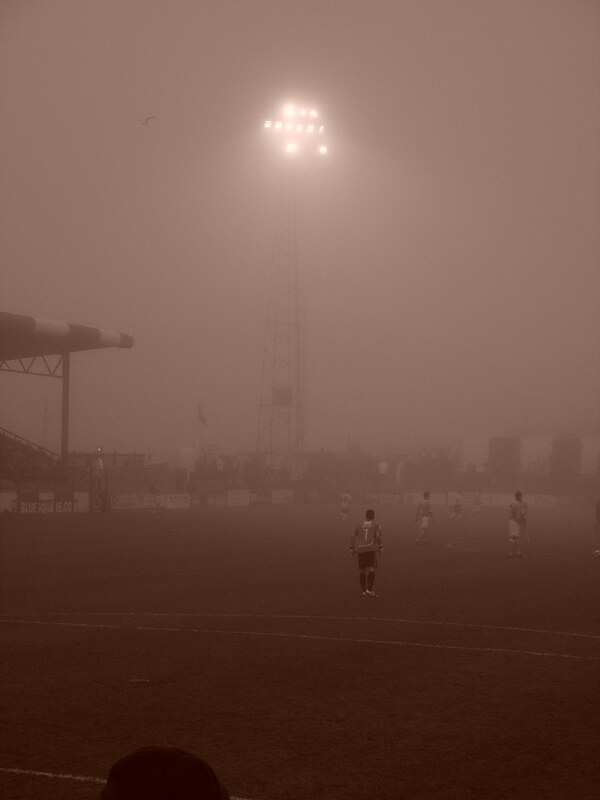 After a mile or so the huge floodlights towered over the landscape – Welcome to Holker Street! And what a proper ground it was too….ancient toilets, turnstile operators willing to give you “the wink” on Lolly’s age, decent terraces and lovely big floodlights. Luton’s originally expected 700+ fans had somehow shrank in the wash and around 300 had made the 283 mile trip northwards in time for Kevin Nichols to lead the Hatters out. Many Luton fans I knew who had made the trip, including Football Jo still had the memories of Wembley still fresh in their minds from last April. Opponents on that day, Scunthorpe United were entertaining Crystal Palace today. Football can be a cruel game. Barrow have quite a passionate following. They have their own Ultras group – Ultras Barrovia, who more recently had run into problems with the police and stewarding at the ground as it appeared that the local authorities did not want to see football fans acting like, well, football fans supporting their team. Now this is not a story for today (although it we have a deeper look into it soon) but it was interesting to see the fans holding up a banner before the game highlighting that passionately supporting your team is not a crime. Luton, on the other hand had left any vocal element of their support back down the A590, M6 (Toll) and M1 by the sound of it. They did start the brighter team though with Newton making use of some space on the right, but time and time again his final ball into Craddock and Hatch was poor. Hatch got himself in the home team’s bad books in the tenth minute when his aerial challenge on Barrow’s Phil Bolland left the defender with a head wound that ended his game. Tempers were fraid for awhile, not helped by Mr Curry in the middle failing to show any consistency, Tikka’ing off players who should be booked and giving plenty of Korma’s when they should have been goal kicks (OK that’s my limit – I’m not as creative as Mr Last). Football Jo, our “nanny” for our trip away, has a bit of inside knowledge into the Luton team due to her “contacts” in the game (which I would say have “allegedly” proved right in the case of Mr Grant at Portsmouth in the case of his relaxation methods most recently) and spent the first half analysing the play, complete with one of the most shocking handbags ever seen at a football match. Barrow’s keeper, Tim Deasy provided the most amusement in the half, dribbling the ball around the on rushing Liam Hatch and essentially taking the piss whenever he had the ball. At one point he bent down in front of us to expose his “PremiumSolutions.co.uk” advertising on his bum. Surely a missed opportunity for a company such as “Peachy Cabs”, “The Bottom Line” or even “Talk Sport”. If truth be told, as Nessa would say, it was a poor half and when the referee finally blew the whistle for the break, we headed upstairs to the Cross Bar for a swift pint and a chat to the locals. Jo had to admit defeat in her search for husband material, with none of the locals up to her high standards (Does he have two eyes – check, is he breathing – check, does he own his own gimp mask – check). Now earlier in the day we had been listening to Liverpool v Everton from Anfield where a “Sea Fret” had been causing problems for the watching millions on TV. I had never head of such a thing, but apparently in the North West of England such fast moving and enveloping fog was common. And lo and behold fifteen minutes later when we returned to the terraces we could hardly see a thing. 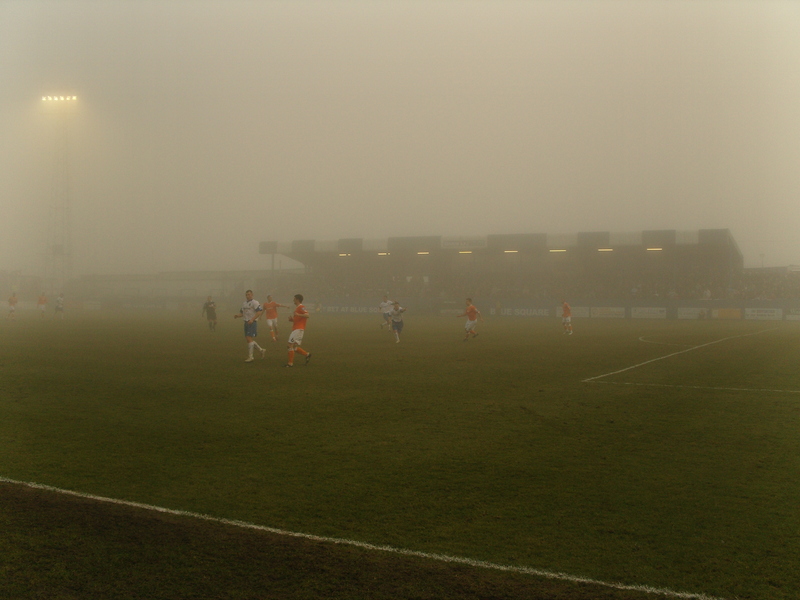 The fog had rolled in and for all intense and purposes the Luton fans could have buggered off home as they couldn’t be seen as well as heard, and quite frankly a draw would have been a fair result with Carlos Logan and Nick Chadwick going close for Barrow, and Liam Hatch missing a good chance for Luton. Neither team would have been too sad if the game would have been abandoned as soon as it hit the magic game deciding 76th minute (why is this the cut off? Surely it would make sense for it to be the 3/4rds mark at 67.5 minutes?) but the referee didn’t see a problem, although for all he could see either goalkeeper could have walked off and we wouldn’t have noticed. And where was the yellow ball? A white ball is hardly sensible in such conditions but Mr Curry didn’t feel it was an issue but then again he did not see most of the other contentious decisions all day so at least in that way he was consistent. With seven minutes to go the deadlock was broken, we believe. Apparently Liam Hatch headed in from a Kevin Nichols corner to give the visitors the lead when we head a muffled cheer and saw the players regroup for a kick off again after a minute or so. The temperature had dropped to almost freezing point and we took our leave with injury time being played out, and after a final experience in the toilets of Calcutta for the girls (I laughed later when one of the Directors, Neil Chalker wrote in the programme that “we do understand that some of the toilet facilities are out of date” having seen them with my own eyes) we headed back to the car and up the road to the biosphere (Centerparcs) where CMF and Littlest Fuller were blissfully unaware of the Fretting we had experienced. So another win on the road for Luton, which put the pressure back on the Play off teams, but more worryingly for Barrow extended their winless home record into a fourth month (the last league home win was on the 17th October versus Ebbsfleet). It is a shame that such a proper non-league club were being dragged into the relegation zone. The crowd was just over 1,500 which was some 600 short of their 2,010 that they had publically declared as their required average for the final ten games of the season. The worrying aspect here is that Luton would have been seen as one of a few teams who should have boosted the attendance to close to the required level. I cannot see the likes of Kettering, Crawley Town, Salisbury City or Histon bringing more than a couple of dozen all of the way here, so the focus must be on incentives to get more locals to attend. On a day that Mansfield Town annouced their “pay what you want” incentive for their home game with Gateshead and got more than 7,000 surely clubs have to wise up to some fresh ideas about how to engage with the locals. So in summary…Barrow-in-Furness. No bus depot, sitting in the middle of some of Europe’s most unspoilt countryside, a bloody long way from home but decent fans, a decent non-league ground and its own weather system that can fool the best adventurer in the world. We salute you.